One comment we hear over and over after the citywide sales is about pricing—specifically inconsistency in pricing, even when the products themselves are pretty much the same. So let’s see what we can do to fix this, shall we? I know it’s the “easy way out,” but this is a major no-no. It’s super irritating to shoppers. Yard sales get busy and hectic, and nobody wants to wait in line just to get a price on an item that’s probably worth a dollar. Shy or impatient shoppers will probably leave without asking. Don’t create a complex pricing system, with charts or different-colored stickers that all have a different meaning. Garage sale shopping is supposed to feel like fun, not like a math test. Instead, you’ll waste a lot of time answering questions about prices, and lots of people will leave without asking. Make it easy for people to buy your stuff. I have a couple of favorite pricing systems. This first one I used myself when I had my last sale. It’s great because it means I don’t have to label everything! I posted signs (LOTS of them!) all around my garage: “ALL KIDS CLOTHING: $1 an item unless otherwise marked.” It made pricing super easy and fast. Another favorite: the “Fill a Bag for $__“. Customers fill a paper or plastic bag with clothes and pay one flat price. If you have a lot to sell, this is a great way to get rid of lots of stuff quickly. This pricing method is so unique (and loved! ), be sure to include it in your sale description. I don’t care what you paid for it. It’s USED. You might see a $68 kids’ Columbia coat from Fin ‘n Feather, but I see a used coat with thinning elbows and sleeves that not so long ago contained your child’s snot trails. Your $200 department store boots seem valuable to you because you dropped a ton of money on them, but to me, they’re just shoes that were on a stranger’s feet. Price accordingly. Shoppers don’t care about your memories and they’re certainly not willing to pay more for something just because you go “Awwww” when you look at it. 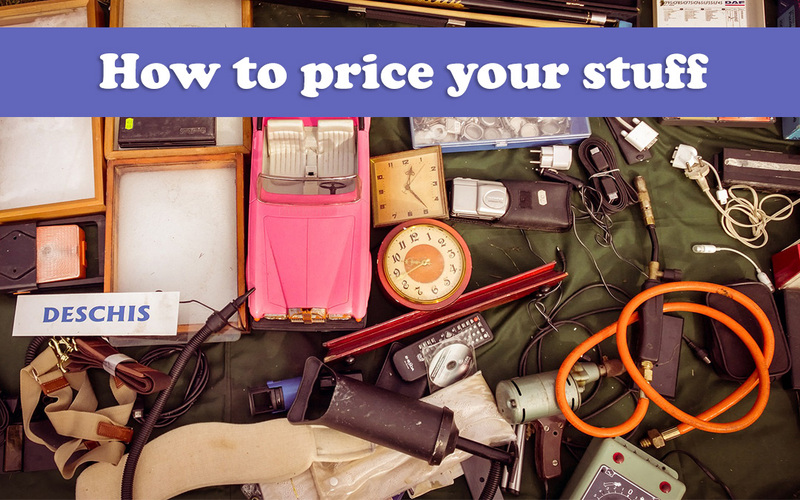 If an item is so valuable to you that you need to price it way more than it’s worth, then just keep it. If you’re a garage sale noob, pricing may seem mysterious. Trust me, it’s pretty darn simple, so long as you can avoid the sentimental and “it was expensive” pricing pitfalls. The Spruce’s Guide to Garage Sale Pricing. It’s stellar. More than 90% of North Liberty’s citywide sales include adult clothing and home decor/housewares. A close second is kids’ clothing, which in particular seems to garner a lot of complaints about overpricing. I’ll summarize those categories here. For everything else, check out the three links above for guidance. Stay in the $3 to $5 range if the item is in good to excellent condition. Items with original tags still on can go for more, but I’d stay under 1/3 of the tag price. Coats in good condition will be $8 to $15. If they’re well-worn or damaged, think $3–$5. Heavy winter coats can be priced higher than lighter spring/fall jackets. Keep material and brand in mind, too. Leather will sell for more, and remember to include any great coats in your sale description. Shoes for adults should be priced at $3 to $7 depending on style and wear. Be sure to give them a wipe-down or even a light scrub with a toothbrush so they’ll fetch more! In short: $3 to $5 for clothes, $8 to $15 for coats, and $3 to $7 for shoes. $1 to $3 for gently used or like-new baby/kid clothes. 25 to 50 cents for well-worn clothes, especially if there are any blemishes, holes, or stains. Onesies in particular are going to be a dime a dozen on garage sale weekends, so I recommend 50 cents for onesies. If it’s a Baby Gap or other high-end brand in good condition, $1 is okay. Name brand items with original tags can be priced higher, but I’d recommend staying under $5 for any single clothing item. Coats should run under $5 with snowpants about $2 to $3. Price heavy winter coats higher than thin spring jackets and keep material and brand in mind. For baby and toddler shoes, keep it in the $1 to $2 range. Older kid shoes and snow boots can be slightly more, $3 to $5. Again, give them a light cleaning beforehand. In short: $0.25 to $3 for clothes, $2 to $5 for coats/snow pants, and $1-5 for shoes and boots. Home decor, depending on what it is, how big it is, and its original value, will usually come in between $2 and $7 apiece. This includes vases, wall art, trinkets, et cetera. Lamps that are operational can go for up to $10 if they’re stylish and in good shape. Picture frames, especially smaller ones, should be $1 to $2. Housewares can vary depending on the item. For small appliances and kitchen gadgets, stay under 1/3 of the retail value. Exceptions are small gadgets like can openers and melon ballers—stick to $1 or so for those little gimmicky things. I feel like I see a lot of “new in the box” Pampered Chef stuff at the NL sales. Keep in mind that shoppers don’t care what it sells for new (and they don’t care to find out). You might get away with pricing a Pampered Chef pizza stone higher than a non-brand-name, but you can’t expect 3/4 of retail price for it. The Home Decor/Housewares bucket can include just about anything in your house, and I could go on forever. Check out The Spruce’s guide to pricing for more help pricing your housewares and homey stuff. In short: It’s hard to generalize, but most stuff will be in the $2-$7 range.